I understand you wrote the script, is that correct? Yes, I wrote the script. Lauren Palmigiano directed, Jack Bishop and Justin Nijm edited, and we had an amazing producing team composed of Jason Carden, Ben Sheehan, Elinor Winkler, Sean Dacanay, Dan Bernstein and Brianne Trosie. It takes a (pioneer) village! What did you know about Dr. Quinn prior to writing this episode? If you had not seen it, how did you learn enough to write it? I grew up watching Dr. Quinn, and there was a solid year or two in my childhood when I sincerely believed I'd grow up to be a frontier medicine woman. (So far that dream hasn't come true, but I can't rule it out entirely.) The episode that really stuck with me as a kid was the one about the girl who had webbed hands -- not sure why that one made such an impact. Anyway, it's quite a coincidence that I got to work on this Dr. Quinn video, because (strangely enough) this wasn't my first foray into the niche world of Dr. Quinn parody... When I was in college I started a theatre troupe with my friends, where we wrote and performed original musicals in our backyard in downtown Lincoln, NE. We had an orchestra and our costumes were made out of cardboard -- it was a very special and very strange thing. (The theatre troupe eventually grew to what is now a non-profit arts organization called The Colonel Mustard, which you can learn more about at www.facebook.com/colonelmustardtheatre.) Our second musical was a loving parody of Dr. Quinn, which centered on a reimagined version of Mike & Sully's stormy courtship. It included surrealist dream sequences, the tragic death of Brian Cooper, and songs with titles like "Boil Some Water! Make it Hotter!" and "The Maddestest Modestest Medicine Woman." We took a lot of liberties. I think it was pretty funny. I'm SURE it was pretty weird. (Click here to see photos of the musical: https://m.flickr.com/#/photos/theopuses/4870985508/) As you might imagine, in order to write a whole musical about Dr. Quinn, we had to dive deep (arguably TOO deep) into research, so I watched dozens of episodes with co-writer Phillip Malcom and producers Meredith Heilman and Joanna Clay. All that to say, I've spent an inordinate amount of time in my life researching Dr. Quinn... and I still can't quite get over that webbed hands episode. Where did the idea for the script come from? I work at Funny or Die, where Jane Seymour came in for a pitch meeting, which is where our writing staff throws a bunch of crazy ideas at a famous person, hoping one of them sticks. Jane came with an idea of her own, to play off of the fact that Dr. Quinn (mostly) prescribed only morphine to her patients, and she probably turned a few of them into addicts along the way. Our discussion in the room turned to Breaking Bad, and out of that came the idea to turn Dr. Mike into a Walter White type of character. What can you tell me about whether or not you had to obtain permission from CBS? This is a parody, and thus falls under "fair use." How long has the video been in the works? This one came together in a matter of months. How much notice did the cast get? Casting was a part of the process, and we scheduled the shoot around availabilities as best we could. It was Jane's idea to go big with casting -- she reached out to the cast and turned it into the ambitious reunion event that it was. Did you change the script once you started filming, or did you have to make any changes based upon which cast members could be there? The script evolved up until the day of the shoot, to allow for casting and logistical developments. There was also freedom for fun improvisation on set. Why didn’t William Shockley have an “interview” segment like the others did? We did interview William (who is awesome and hilarious!) but had to cut his segments for time. We were excited to feature some of his other scenes with Jane, though -- he played the "Jesse" character to Jane's Walter White, and you can see he's wearing a Jesse-style beanie in a couple of the shots. Did anything surprise you about the cast? I expected the cast to be wonderful, and they absolutely were. Very nice and talented people. Some of their stories about shooting DQMW surprised me -- did you know there was a real working train on set? And they would sometimes just go off and ride horses on nearby trails between scenes. Orson and Allie talked about how meaningful it was to work with Johnny and June Cash. It sounded like shooting the original show was an idyllic experience, and you could tell everyone loved being back on that set. Did the cast make any suggestions about how their character would act or what their “trademarks” were? Yes, they all certainly knew their characters much better than we did. The challenge in this piece is that they had to switch between playing a bizarro version of their character in the scenes and playing a bizarro version of themselves in the interviews. Now that's acting! Do you happen to know where the wig came from that Joe wore? Or who chose it? Or whose idea it was not to completely cover his real hair? Sometimes you plan jokes and sometimes jokes just happen. We planned for Joe to have a hilariously long wig, but it didn't end up fitting like we thought it would, and once everyone saw the ridiculous way it looked with his real hair peeking out, it became clear that it was the funniest option. Joe was a very good sport. What challenges did you face in shooting it? Fake trailers are always a challenge to shoot, because you are trying to set up a lot of shots that all look like they're from different scenes in a full length TV show. That usually translates into a lot of locations and company moves. Fortunately it was a lot easier for us on that Western Town location (which is the same town from the original DQMW, by the way) because everywhere you turned looked like a new setting. The cast members who have commented have said that they had a lot of fun doing it. Did the Funny or Die crew enjoy the shoot as well? We got to play around with horses, pioneer clothes, ridiculous props and awesome actors on a beautiful set with perfect weather. So yeah, we had a blast! Is there any chance that we will get to see some outtakes? Do you have any funny anecdotes you can share about the shoot? Not to spoil "movie magic," but the funniest reoccurring thing on that day was that our (amazing) DP Jonathan would yell "DUST" before rolling, which would cue two FOD interns to run across the set, kicking up as much dust as they could. They had great attitudes about repeatedly doing such a silly and thankless task. We were all covered with dust by the end of the day, but it looked GREAT on camera. You sound pretty pleased with the reaction from the fans. Did that surprise you? We've been really excited by the generally positive feedback from fans! Whenever you play around with beloved characters and turn a story on its head like we did, you're never sure if the fans will enjoy it or be offended. Our jokes all came from a place of love for the Dr. Quinn characters and world, so hopefully that translated on screen. Has fan reaction encouraged you to do another video? Maybe... that would be fun! Who knows! Maybe start a petition and we'll find out? If there’s another video, will there be an attempt to get more of the cast members? Are you in the photo with everyone that was taken in the picnic pavilion? If so, which one are you? 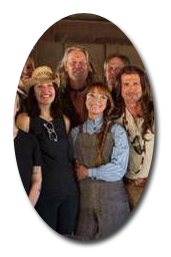 Yes, I'm the one in a cowboy hat standing next to Jane.